A pen of three bull calves, consigned by NebraskaBison.com is sold during the Gold Trophy Show and Sale. The calves brought $1,600 each. Traditionally, when people think of the National Western Stock Show, they think of cattle. However, as the years have gone by, the bison show and sale has grown as people become more aware of the benefits of bison. The 32nd National Bison Association Gold Trophy Show and Sale was held on Jan. 20-21 in Denver, Colo. There were 126 live animals and 27 carcasses that competed in the market class competition. “Our market is growing because our customers appreciate the fact that bison ranchers refuse to compromise on the integrity of their animals,” according to Dave Carter, National Bison Association Executive Director. Producers from 12 states including Colorado, Wyoming, Nebraska, South Dakota, North Dakota, Montana, Kansas, Utah, Oklahoma, Texas, Indiana, Michigan, as well as producers from Canada participated in the GTSS. The Grand Champion bull was exhibited by Bison Spirit Ranch out of Oak Lake, Manitoba Canada. The 1,158 pound bull, owned by Tevor and Jodie Gompf, sold for $11,000 during the sale. This ranch was also awarded the Rookie of the Year award. They also had the Reserve Grand Champion bull, who sold for $11,500. 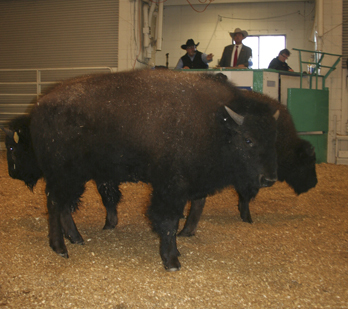 The Grand Champion female was exhibited by High Country Bison, out of Austin Texas. This 1,071 pound female, owned by John Russell, brought $6,000. The Reserve Grand Champion female was exhibited by Wichita Buffalo Co., LLC, out of Hinton, Okla. The female, owned by James Steep, sold for $3,500. The high seller in the sale was a 1,785 pound 2-year-old bull bought by the Wolverine Bison Company out of Humboldt, SK, Canada. The bull was owned by Mark Silzer, and sold for $23,000. One producer from Colorado, the Cold Creek Buffalo Co., offered several animals in the sale. Boyd Miller, who runs the ranch with his wife Allison, runs his Bison on the Terry Bison Ranch in Cheyenne, Wyo. The ranch is right on the Colorado/Wyoming border, just to the east of Interstate 25. Miller has been in the business for more than 10 years, and has now built his herd up to include 800 cows. He has 3,700 total, including cows, bulls and feeder animals. The bison were moved to the Terry Bison Ranch in 2006, where they can roam on more than 27,000 acres. Miller uses a rotation grazing system with the bison, so the land is not overgrazed. They have also learned that to move bison, you must have patience and a good plan. Miller uses a truck with a protein supplement called cake to lead the buffalo where he wants them to go. “When moving buffalo, it’s just about being patient. You are not going to force them to do anything they do not want to. As long as you are patient, you are fine. If they run towards something they will hit it as hard as they can, so we try to prevent that. You can’t treat or handle them like cattle or it blows up in your face. It took a good four or five years for me to get past some of the cattle handling I knew,” said Miller. He takes pride in raising buffalo, and has a lot of respect for their power. “I enjoy the animal. They are very self sufficient, and majestic. It’s amazing to me the mother nature side of things that they have figured out so well,” he said. Fences can be a problem with buffalo, as they can charge through just about anything. However, Miller has found a pretty simple solution to this challenge. “Just keep them happy to keep them in. If they want out of anything, they will get out. I’ve seen them jump 6-foot fences flat footed. As long as you don’t pressure them. And they are happy with feed, they are less likely to eat across the fence. If they decide they want out, you can’t stop them,” he said. Miller has his buffalo processed at Double J Meats in Pierce, Colo. The whole carcasses are then transported to Rocky Mountain Natural Meats in Denver, Colo., where they are fabricated. “They are the largest processor of bison in the country,” said Miller. His product goes out to stores such as Whole Foods, King Soopers and Safeway, just to name a few. He finished 2,500-3,000 head per year, which includes his own calves as well as those that he buys. Another producer who brought bison to the sale belonged to NebraskaBison.com, which operates out of Adams, Neb. The ranch runs 500 cows, where they finish out the calves and sell meat to Rocky Mountain chefs, retail stores and online. The ranch was started in 1995, when Randy Miller, the owner, bought 20 heifer calves from Custer State Park. He shipped them to his ranch, and the herd grew from there. At first, Randy Miller was in the bison business as a hobby. However, as the word spread, he found there was a growing demand for all-natural bison. The mission of the company reflects their personal attitude towards producing a quality program. Those in the bison industry are excited for the future of the industry. It has grown substantially the last few years, and continues to grow. “The future if definitely bright. Bison meat prices have climbed to historic high levels, and those dollars are flowing directly back to producers. New markets are emerging every day as more people incorporate bison as a regular part of their diet,” according to Carter.